Q: According to reports, ROK Ministry of Unification spokesperson said on January 5 that the DPRK has accepted the proposal for high-level talks at Panmunjom on January 9. what is China's comment? A: We have noted this latest development. In past few days, I stated China's stance in response to the positive trend in the situation on the Korean Peninsula several times. I would like to stress again that as a close neighbor of the Peninsula, China welcomes and supports the DPRK and the ROK's recent positive moves to improve their relations. We also hope that the international community can give its support and work together to find a viable path to easing tensions, enhancing mutual trust and resuming dialogue. China has all along been making relentless efforts to resolve the Korean Peninsula issue and playing a positive and constructive role. Under the complex and sensitive circumstances on the Peninsula, China has always spoken in a rational and calm manner, worked on various parties and promoted peace talks. 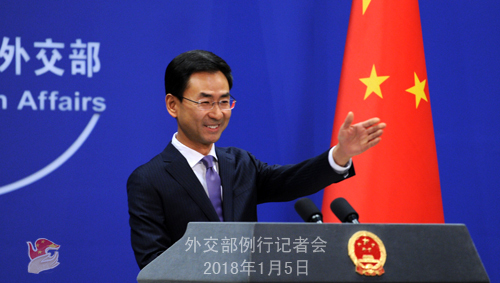 I would like to call again here on all relevant parties to work with China to play their due role and fulfill due responsibility, seize the current positive trend in the situation on the Peninsula, and join hands to bring the Peninsula issue back to the right track of peaceful settlement through dialogue and consultation at an early date. Q: On January 4, French president's office announced President Emmanuel Macron's visit to China. Can you confirm that and give more details about the agenda of his visit? A: At the invitation of President Xi Jinping, President Emmanuel Macron of the Republic of France will pay a state visit to China from January 8 to 10. This is President Macron's first state visit to China, which is of important significance as it will carry on the past and open the future. During the visit, the two heads of state will comprehensively review and look into the future of China-France relations. Drawing on the past, the two sides will further enhance mutual political trust, consolidate strategic consensus and chart the course and plan for cooperation and exchange in political, economic and trade, cultural and people-to-people and other fields, and scale the close and enduring China-France comprehensive strategic partnership to new heights. Both China and France are permanent members of the United Nations Security Council, and the China-France relations extend far beyond the bilateral scope and takes on global significance. During the visit, the two heads of state will exchange in-depth views on international situation and major international and regional issues and discuss how to strengthen cooperation, uphold multilateralism, advance multi-polarism, build an open world economy, improve global governance, jointly cope with global challenges and build a new type of of international relations and a community with shared future for mankind. During the visit, President Xi Jinping will hold state events for President Macron. Premier Li Keqiang and Chairman of the Standing Committee of the National People's Congress Zhang Dejiang will meet with him on separate occasions. The two sides will have exchange of in-depth views on China-France relations and issues of common interest. During the visit, President Macron will also visit Xi'an, Shaanxi Province and the Forbidden City in Beijing. Q: In a tweet, President Trump took credit for the DPRK and the ROK holding their official talk, saying that it was the result of his firm and strong stance to commit US might against the DPRK. What is your comment? 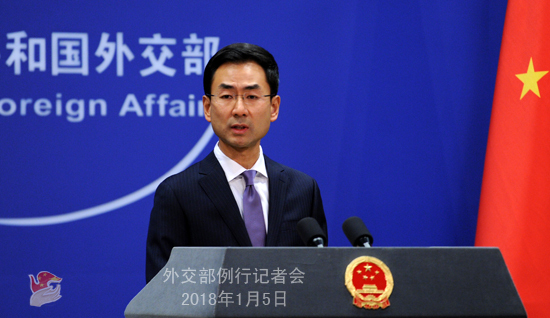 A: We stated China's view and position on recent positive trend on the Korean Peninsula in last few days. The resumption of communication and talk between the ROK and the DPRK is conducive to improving inter-Korean relations and easing tension on the Peninsula and in the interests of this region and the international community. 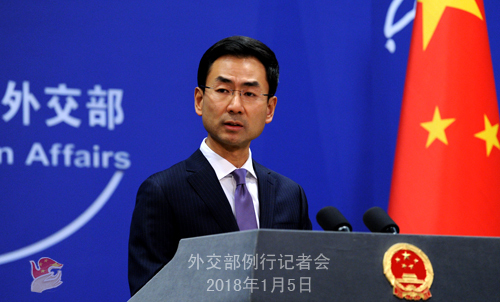 China welcomes the efforts of parties in this region and the international community to improve inter-Korean relations, and is playing a constructive role to this end. As I just said, we hope all relevant parties can play their due role and fulfill their due responsibility. Q: According to ROK media reports, several ships owned by Chinese companies have changed their flag state and place of registration for several times, and engaged in activities in violation of Security Council's DPRK-related resolutions. What's your comment? A: My colleagues and I took similar questions many times over last few weeks. The Chinese government has always comprehensively and strictly implemented Security Council resolutions and fulfilled its international obligations. We never allows Chinese citizens and enterprises to engage in activities violating Security Council resolutions. The international shipping industry is highly open, and it's very common for ships to change their flag state and place of registration or to be leased to other parties. With regard to the operation of ships registered in a third country, China is not aware of every detail. China will seriously punish any action that is verified as a violation of Security Council resolutions. Q: The ROK announced yesterday that the US and the ROK have agreed to delay joint military exercises during the Pyeongchang Winter Olympics. What is your comment? A: This is undoubtedly a good thing. As we said many times, we welcome the recent positive trend on the Korean Peninsula. We hope relevant parties of the Korean Peninsula issue can take this opportunity of Pyeongchang Winter Olympics to work for the shared goal and make concrete effort to ease tensions on the Peninsula, bring the issue back to the right track of peaceful settlement through dialogue and consultation and realize the denuclearization of the Peninsula. Q: According to our information, speakers of the parliament of the Nordic and Baltic countries are visiting China in days. Can you brief us on relevant background and details of this visit? A: At the invitation of Zhang Dejiang, Chairman of the Standing Committee of the National People's Congress (NPC), speakers of the parliaments of the Nordic and Baltic countries will pay a joint visit to China from January 7 to 13. The delegation includes speakers of the parliament from Finland, Norway, Island, Estonia, Latvia, Lithuania and the first deputy speaker of the parliament from Switzerland. During this visit, Chairman Zhang Dejiang will hold talks with them and we are now in communication on other arrangements. Speakers of the parliament of the Nordic and Baltic countries have a joint visit mechanism. For some time, the parliaments of these countries have expressed to China their will for a visit. This marks the first joint visit to China by speakers of the parliament of the Nordic and Baltic countries. We are pleased to see this visit be paid at the very beginning of the new year and hope that it will deepen China's bilateral relations with these countries and exchanges between legislatures and promote comprehensive development of China-Europe relations. At present, bilateral relations between China and the Nordic and Baltic countries are developing in a sound way. The China-Nordic cooperation is advancing steadily and the cooperation between China and Central and Eastern European countries, including the three Baltic countries, are flourishing. China highly values its relations with the Nordic and Baltic countries and stands ready to work with relevant countries to promote the comprehensive and smooth development of bilateral relations, regional cooperation and China-Europe relations. Q: According to what we learn, China has recently rolled out a new visa application system for foreign talents. Do you have more information on that? What kind of changes can be expected with the introduction of this new system? A: On November 28, 2017, the State Administration of Foreign Experts Affairs, the Ministry of Foreign Affairs and the Ministry of Public Security have co-released a document regarding the implementation of the Foreign Talents Visa System, which aims to further expand the scope and the validity period of visa issuance. China's diplomatic missions overseas, following instructions from the Foreign Ministry, have begun to further streamline visa application procedures for foreign talents who are certified by China's competent authorities of talents affairs. There are four most salient features in this new system. First, the longest period of validity, that is to say, eligible foreign personnel will be issued visas valid for as long as 10 years. Second, the longest stay, which means that the visas are valid for a maximum stay of 180 days. Third, the fastest review and approval, which means visas can be issued just one day after application. Fourth, most preferential treatment, including free-of-charge application, which enables foreign talents as well as their spouses and children to be charged nothing for visa fees and dispatch fees. 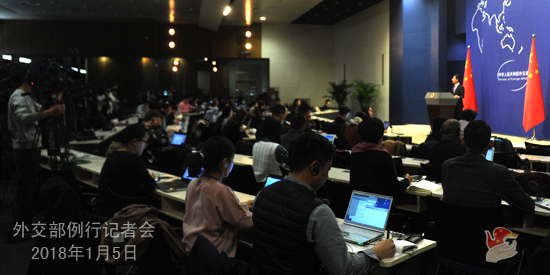 These new measures to optimize and reform visa system will enhance the openness in drawing in foreign talents, attracting more of them to participate in China's advancement, and boost China's overall capacity for innovation. It will also enable foreign talents to share the opportunities presented by China's development, give full play to their talents, and achieve a successful career.